What Are the Dangers of Grow Lights? Grow lights are bulbs used indoors to help plants grow without the need for sunlight. 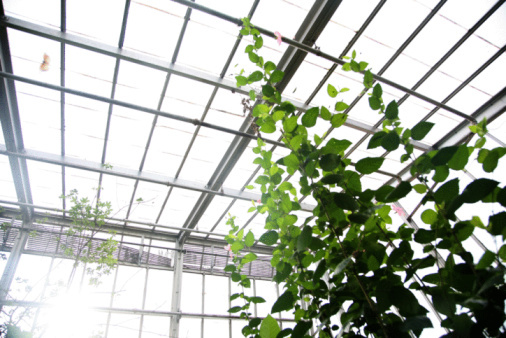 Sunlight uses a wide spectrum of light colors which plants readily absorb, so grow lights need to mimic the type of light the sun produces as closely as possible. Fluorescent lights can use full-spectrum bulbs to create as many wavelengths as possible, while other plants depend on certain types of wavelengths produced by halide or halogen bulbs. Growers should use these bulbs carefully to avoid problems. Grow lights can create fire and mold problems. Fluorescent bulbs, among other growing light options, contain a small amount of mercury vapor. This is why fluorescent bulbs must be treated carefully and avoided for a short time if they suddenly break. Mercury is a highly toxic element and growers must be very careful to not breath in any of the vapor if their lights suddenly burst or drop. Mercury stays in the body for long periods and causes brain and kidney damage, among other problems. When growers hook up their grow-light arrays, they do not always consider voltage and amperage requirements. Large grow-light arrays require a 220 volt dryer outlet, and even these outlets have amperage limitations. Too many bulbs or too much energy requirements can cause the bulbs to burn out or create electrical problems at the outlet. The main danger is an electrical fire caused by electrical mismanagement. Growers leave their lights unattended for long periods of time, which adds to the problem. When growers use their light in high humidity, they create a unique problem. When the bulbs turn out, they heat up the air and help evaporate any standing moisture present. When the bulbs cycle off to cool down or imitate nighttime conditions, this moisture condenses again. It condenses not only on plants but also on walls and floors. This creates prime conditions for mold or mildew growth, which can pose serious structural and health dangers. What Lights Can I Use in a Walk-In Freezer? What Happens to Plants if They Have No Sun? Do Plants Grow Faster in Light or Dark?